Do you remember that wool pullover from your grandma? Yeah, the heavy one with much more than 2 colors or a very tasteful motive on. It is that one that you only wear once a year when your grandma is there. The itchy one. When you think about this pullover your skin turns red. Several years ago I had such a pullover. It was made of pure wool of sheep. I could never wear it. Way too itchy. Now, after purchasing several other wool products, I wanted to know why some kinds of wools are itchy and others are very soft and cosy. I think that topic fits very well to our actual theme session about surfaces. In fact, there are only few parameters which define the feeling of a specific material on our skins. Of course, there are differences in experiencing these different kinds of materials and surfaces. For sure a lot of people will never have problems with wool. Why would you prefer wool in general as a superior material for your wearables? I would answer this by mentioning the attributes that can be delivered by wool in comparison to synthetic fibers. First to mention is the ability to regulate moisture, including sweat. Maybe this sounds a little bit trivial, but this property makes the difference between a stinky and a neutral smelling shirt. As you can see in the picture above, synthetic fibers are smooth, as natural keratin wool has a lot of „scales“ which make the surface rough and overall surface is much bigger than the surface of the synthetic fabrics for example polyester. This increased surface itself lets the water much easier evaporate, only sweat which can be metabolized by bacteria lets a shirt smell bad. So it is not the sweat itself which smells. On polyester, the sweat stays for much longer, so the bacteria have much more time to operate. Furthermore, the rough surface makes it harder for bacteria to attach on. Other materials, which are also hygroscopic, like cotton or linen only have the possibility to store water inside the fabric/fibers. The stored sweat is not available for bacteria to metabolize, but of course it does not prevent bad smell such good as wool can do it, because of the limited storage available. The other effect mentioned above is still existing but less significant. Of course, it is possibly also depending on the fabric itself, that moisture can be regulated by ventilation and convection. The second big advantage of wool as a second skin is the active heat management, which is directly connected to the evaporation rate, especially when we talk about cooling. So, it is no surprise that the fast water evaporation leads to a lower temperature. When we talk about warming, then the hygroscopic effect is interesting again. It keeps the skin dry and the curled structure of wool fabrics generates air pockets, where the air can stay. The curled structure has another side effect. It minimizes the contact area of the fabric to the skin, so the heat conduction is also reduced. These effects are also helping during the cooling process. Specific kinds of wool also have the ability of warming, when they are moist! Maybe the description of the absorption process follows in a later article. Now I want to give you an overview about the different kinds of wool. Cotton is the only herbal kind of wool in this context. The fibers are harvested from the seed hairs of Gossypium. For a low budget this fibers are the perfect option, because in general cotton is cheap and easy to wear and clean. It is a more passive material for clothes, because it is not very good for warming or cooling. Of course, there a very big differences in quality and fiber length, depending on variety and production location. The best cotton is the West Indian Sea Island Cotton and has fiber length up to 55 mm. Also, it is possible to give cotton different kinds of refinements. My personal favourite is the mercerisation, where the yarn is pulled through a sodium hydroxide solution. The yarn macerates and the cross-section changes from reniform to round, while the fiber length gets reduced by 25%. Also, the mechanical strength and dimensional stability is increased, which means the fabric is more robust and keeps its shape also during a lot of cleanses. The characteristics maybe change a lot, but it is very cosy especially as underwear! Furthermore, the cotton gets a shiny like silk and is easier to dye. The classic wool is gained by shearing of healthy and living sheep. You should look for the Woolmark seal, to be sure that this criterium was fulfilled! It is a very soft and smooth material. But here we are, depending on some parameters, the wool can be also very itchy. Because of the worldwide demand in many kinds of wearables, wool is still considered a low-priced nature product. Different to cotton, wool is a very active material. It can help to regulate the temperature in hot and cold days. Merino wool is another kind a sheep wool usually from Australia. Because of the longer growing time of the fur, the fibers are thinner and more elastic. The lesser fiber thickness leads to much less problems for many people (more information below). Many fabrics are traded as „next to skin“ and I think this definition is more than correct. Another big advantage is the smell neutrality. You can wear your pullover, shirts, etc. for a long time without washing. Usually you only need to ventilate your merino product for a while and it is fresh again. The general cleaning mania is very questionable and profit oriented. A good wool does not be washed once a week. 3-4 times a year is much more gentle to the material. This counts for all animal wool fabrics! Alpaca camel wool is one of the most expensive kinds of wool because the very slow growing fur. The camel get sheared only once in 2 years! But you get very light and flexible fibers with an isolating effect. It is perfect for winter wear. 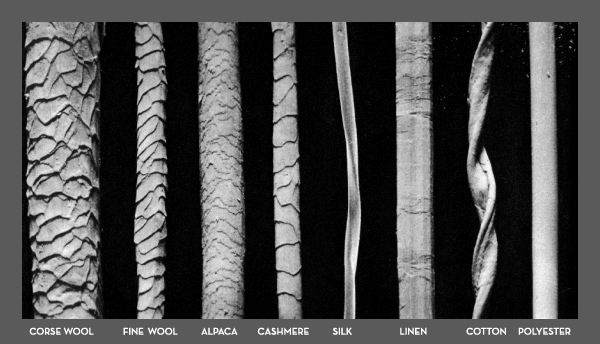 In the next part I show you examples of the fiber characteristics and how wool is separated in different quality levels. Angora rabbit wool is collected by shearing, combing or plucking. Especially the plucking on the living animal is very brutal. That is why the demand of that kind of wool is diminishing in the last years. Of course, the fabric is very warming and fluffy, but also very fuzzy. Mohair wool is a product of the angora goat. It is the lightest of all kind of wool and very comfy to wear. The refinement process is very complicated and the results are still fuzzy. But the lightness and the high flexibility makes this in my opinion to the best wearable fabric in winter. 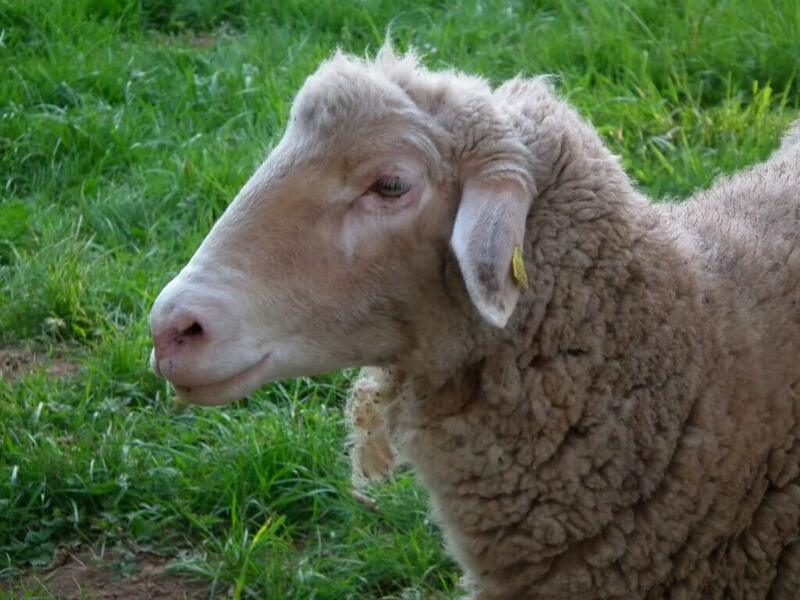 For warm days I miss the active characteristics of merino wool. Cashmere is maybe the one with the most well known name, when it comes to name high quality wool. The fibers are collected from the cashmere goat by combining. It has a slight silky touch and is most used together with other fabrics. It is very light and thin. It also has high warming capabilities. 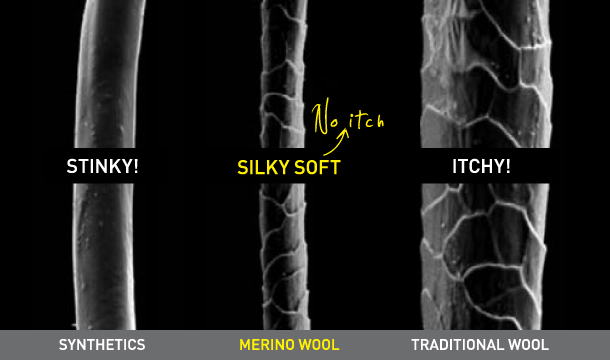 The most interesting parameters in the context of itch and scratch are the fiber length and fiber strength. The quality of the spin process and specific refinements are the secondary parameters, but still with a big influence on the wear experience. The fibre length is meant to be the real length of a fiber before any refinements or the spinning process. It seems that the length is important to create a yarn which is consistent in shape and roughness over the full yarn length. Are the fibers too short, you can get a rough feeling on your skin, but doesn’t have to be itchy. My experience over the last years taught me, that the fiber strength (or thickness) is the most important factor. It is pretty easy. If the fiber is too thick, bigger than 25 µm, then the fabric gets itchy. This is directly connected to the flexibility of the fiber, because the itchiness is mostly an irritation of your skin. It is the contact with a fiber which is not elastic enough to bend. To give you an overview about the dimensions I use the example of alpaca wool and how it is offered on the market. These fiber thickness values are given in Micron. It is meant to be the same like µm. This overview should help you to find the right fabrics. For your orientation, some people experience the superine grade as already itchy! To summarize both of these characteristics: The fiber length and strength are leading to the ability of bending. If the fiber is too short, it easily gets stiff and creates an itchy feeling. Same counts for an increased fiber strength. In extreme cases this can lead to skin irritation! By the way, the receptors on your skin to feel itchy are different ones then for example the ones for pain! The itch and scratch mechanism is an important reaction of the body to protect the organism of small but maybe harmful particles. How many times did you scratched yourself by reading this article? I would bet not more than me during the writing… It is a normal reflex to be much more sensitive for itches during thinking about itches! Britannica. Vol. 12, P. 746 f.